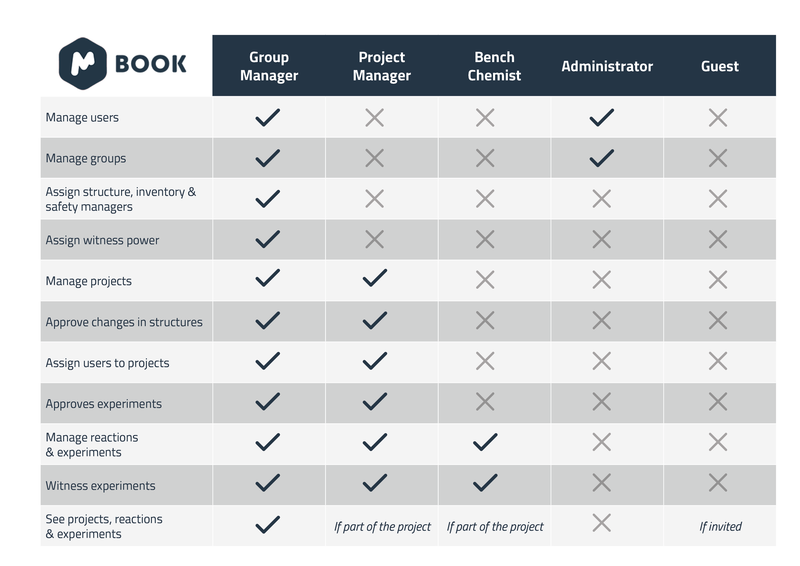 Mbook provides several levels of access through user roles, limiting access depending on the position occupied by the individual user (Admin, Project Manager, Group Manager, Bench Chemist and Guest). In addition to these roles, Mbook offers the possibility of further customisation of permissions by allowing Group Managers to designate Safety, Inventory or Structure managers. The Group Manager role is for team leaders with management & lab responsibilities. The group manager can create users, groups, projects, reactions and experiments. In addition, it can assign extra permissions to other users so they are responsible for inventory, safety or structures. Witness and approval of experiments are also part of the permissions granted to group managers by default, as well as designating other users that can witness and approve too. When Mbook is used by organizations with a simple structure, only one group manager will be needed. Larger entities can replicate their internal organization by having several users designated as Group Managers. This is a suitable role for staff members that own projects but are not in charge of teams and haven’t got management responsibilities. As such, Project Managers can create projects, reactions and experiments, but not users or groups. They can, however, assign an existing user to their projects. Project Managers can also witness and approve experiments. This is a role designed to fit chemists that have neither management responsibilities nor ownership or projects. A Bench Chemist can create reactions and experiments, but not groups or users. They can also be witnesses of experiments. By default, Bench Chemist users will only see their own experiments in the navigation tree of the Desk panel, but this can be modified. This role is for authorised users in management roles and is key for the initial configuration of Mbook. A user with administrator rights is automatically created for new organizations when they start using Mbook (but we don’t charge a license for it). The administrator has all permissions granted to Group Managers, except it cannot create or work with projects, reactions or experiments. An administrator, however, can create groups that are completely independent from each other, something a Group Manager cannot do. If your group is small, then this role is rarely needed. This is useful for organizations that have several sites or very distinct working groups within a lab, for example separated groups for analytical and synthetic chemistry. In the future, we expect the administrator role to become more important in Mbook, as we add functionalities that will require an authorised user to supervise them, like stockroom or the setting up of Audit trails. This role was added to Mbook in version 2.1, following several requests from Contract Research Organizations (CROs). CROs wanted to be able to prove to potential clients their expertise in certain processes or to show existing customers progress on their projects with the CRO. With this in mind, Guests only have permission to see projects or groups that they have been granted access to.